The name originated in a letter, written by someone claiming to be the murderer, that was disseminated in the media. The letter is widely believed to have been a hoax, and may have been written by a journalist in a deliberate attempt to heighten interest in the story. Within the crime case files as well as journalistic accounts the killer was known as "the Whitechapel Murderer" as well as "Leather Apron". Attacks ascribed to the Ripper typically involved female prostitutes who lived and worked in the slums of London and whose throats were cut prior to abdominal mutilations. The removal of internal organs from at least three of the victims led to proposals that their killer possessed anatomical or surgical knowledge. 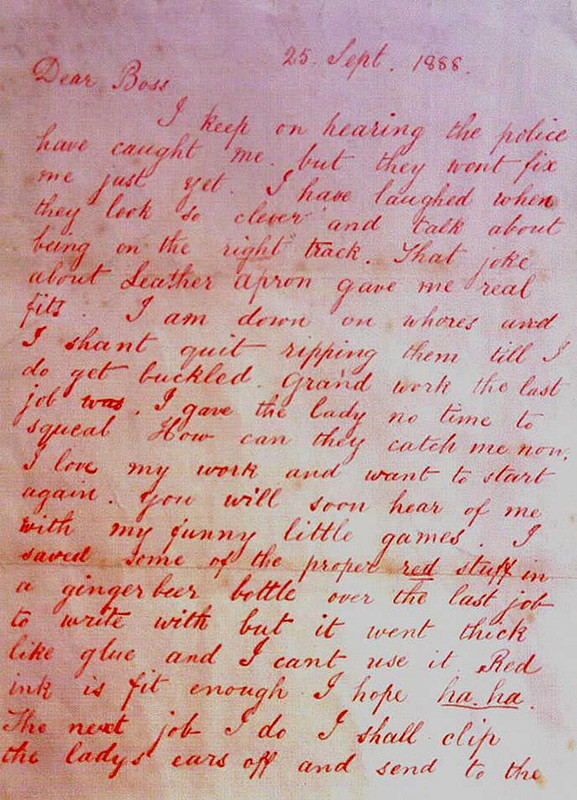 Rumours that the murders were connected intensified in September and October 1888, and letters from a writer or writers purporting to be the murderer were received by media outlets and Scotland Yard. The "From Hell" letter, received by George Lusk of the Whitechapel Vigilance Committee, included half of a preserved human kidney, supposedly from one of the victims. Mainly because of the extraordinarily brutal character of the murders, and because of media treatment of the events, the public came increasingly to believe in a single serial killer known as "Jack the Ripper". Extensive newspaper coverage bestowed widespread and enduring international notoriety on the Ripper. An investigation into a series of brutal killings in Whitechapel up to 1891 was unable to connect all the killings conclusively to the murders of 1888, but the legend of Jack the Ripper solidified. As the murders were never solved, the legends surrounding them became a combination of genuine historical research, folklore, and pseudohistory. The term "ripperology" was coined to describe the study and analysis of the Ripper cases. There are now over one hundred theories about the Ripper's identity, and the murders have inspired multiple works of fiction.